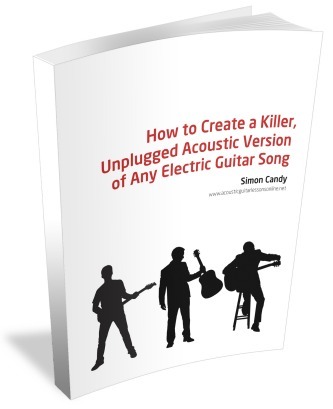 Do you want to learn how to create a really cool unplugged acoustic guitar version of any electric guitar song? Taking an electric guitar part and playing it note for note and chord for chord in your acoustic guitar song simply won't cut it. However, fear not, there are some really cool, easy, and creative things that you can learn to do with existing chord progressions and the like, that will have your unplugged song for the acoustic guitar sounding awesome! You will amaze your friends with these new found approaches to making a killer acoustic guitar unplugged version of practically any existing electric guitar song. Know how to include moving bass parts in your chord progressions so that you can play your acoustic guitar song with a killer bass line at the same time. It will sound like you are playing two instruments at once… then watch your friends’ mouths drop to the floor in amazement. You’ll smile when they ask, ‘how are you doing that?! !